Hey Love: Finds Under $50!! Hats!! Hey babes! Welcome to this weeks Finds Under $50! Hat Edition. As the days are getting warmer and we want to spend more time outside a good hat is a definite MUST! Hats are the perfect accoutrement for a summer stroll, a day at the beach, or grabbing some happy hour drinks with friends at that cute outdoor bar. Not only are they practical--the less sun on our faces the better--they add that extra flair to your outfit, and are an easy fix to a bad hair day! Not to mention they are a great investment. Hats last forever and are always "in style". Check out my latest finds! I'm obsessed with the Blue and White Wide Brim and the Lace Pageboy Hat! Sadly, I was only able to bring one hat with me to Bogota. May just have to add one of these to my hat collection! Which one is your fave?! Such adorable hat! I'm really into baseball caps for this summer and fall.. This is a GREAT post. Hats are so important in the summer time. Not only are they stylish, they are EXCELLENT sun protection. My friend bought a straw hat from H&M for only $1.50. But your choices are all great. Also, when you get a chance, please take a look at my beauty and skin care blog. Thanks! Thanks for visiting by blog. I'm your newest follower on GFC and Bloglovin'. Please follow back if you like. Ohhh LOVING the three middle ones! Great post! 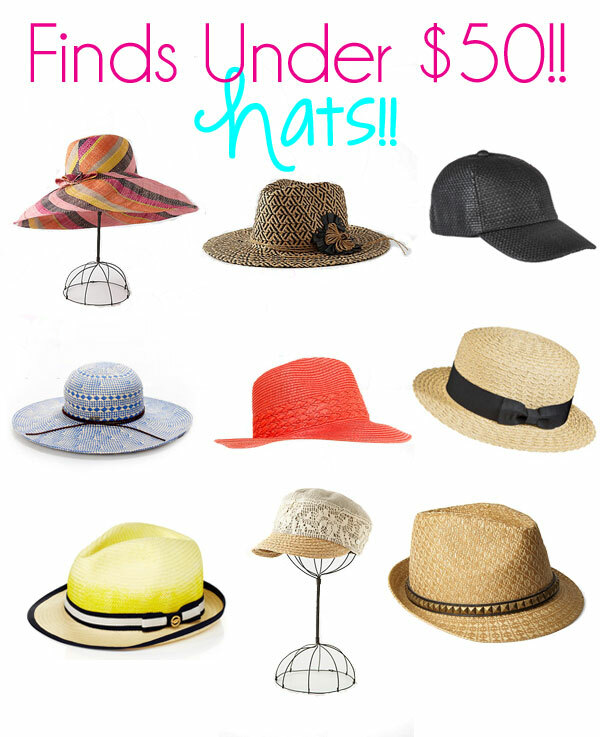 I'm always looking for new hats for the summertime! I love the blue and white one! hey dear! thanks for the visit and the comment! love that hat post! we're wearing way too less hats these days! let' stay in touch! love <3 tones. my passion is hat !!! Love! I need a nice wide-brimmed hat for summer. Hello love! I need a hat for the summer and these are great choices.#1, 3, 4, 7 have my name on it. So many cute options! I think #1 and #4 are my favorites. These are all beautiful hats! I love 3, 4, and 8 most - they're all fantastically beautiful! I need to learn to wear my hats more...they're all so lovely. I'm obsessed with that first one! So cute! Ooh, I haven't tried on a hat since I cut my hair - I'm curious to see how it will look/feel. My favorite of these is the bottom middle one - adorable! Love the juicy couture yellow hat, so cute and perfect for summer. The first one is nice too!! I'm such a hat fan, love these pretty much all!